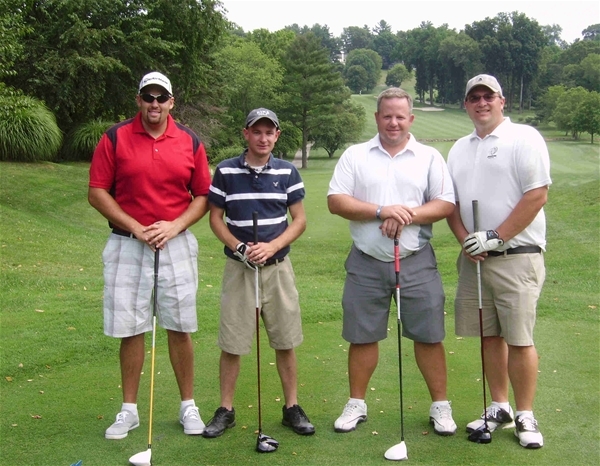 CHAMP Flight members Doug Hilgenberg, Mike Krantz, Andrew Neal, and Jay Vasil on the back tee of the Par 5 7th hole at Radley Run Country Club. Radley Run Country Club in rural West Chester, PA was the tournament venue for the GOLFWEEK Amateur Tour (Philly Metro) tournament on Saturday June 30th, 2012. A field of forty tour members competed on a hot and humid summer afternoon, with a threat of severe weather (that thankfully never materialized). This fabulous private golf course was designed by Englishman Alfred Tull, and opened in 1964 on the site of the former Brandywine Hunt Club property. The course features sweeping vistas of the surrounding horse farm country, elevation changes, numerous water hazards, and several brilliant risk-reward holes. We proudly welcomed Wes Samons from the Metro NY Tour, and Karl Yergey and Ken Mutzabaugh from the DC Metro Tour to the event. In the Championship Flight, Andrew Neal broke through and won his first GOLFWEEK Amateur Tour event by 5 strokes over two other players. Andrew’s fine round of five-over par 77 (37-40) included 1 eagle, 10 pars, and seven bogeys from the back tees. Andrew chipped in for an 'eagle' 3 on the Par 5 2nd hole. Mike Krantz (43-39, 82) took 2nd on a match of cards with Cesar Martinez (41-41, 82). Both player made two birdies during their round. The A Flight winner also celebrated his first victory on the GOLFWEEK Amateur Tour. Dave Upchurch shot a great round of 77 (40-37) from the ‘middle’ tees used by most of the field. Dave’s round included 2 birdies, 11 pars, and four bogeys. Returning member Tim Turner was four strokes back in second with an 81 (43-38). Albie Sanguiliano (82, 41-41) nudged Tony White (82, 40-42) for third on a match of cards. White was the only player in the entire field to par the difficult uphill Par 4 5th hole, which plays as the #1 handicap hole on the course. John Divalentino, Sr. holed out for an amazing eagle ‘2’ on the risk-reward Par 4 15th hole, with a creek bisecting the fairway in two different places. Great shot, John! In the B Flight, newly promoted member Kyle Mazza took the title in a one-hole playoff over Jim Boyce. Mazza’s round of 86 (45-41) included 7 pars, 8 bogeys, and 3 ‘doubles’. Boyce’s round of 86 (45-41) included 7 pars, 9 bogeys, and 1 ‘double’. Both Kevin Cockerham (87, 44-43) and Dan Schwitters (87, 42-45) missed out on the playoff by 1 stroke. Mazza secured victory over Boyce with a par 4 on the first hole. The C Flight champion was Steve Mumford, who earned a promotion to B Flight with his second consecutive victory on tour. Steve’s round of 86 (47-39) included a great ‘eagle’ 3 on the Par 5 16th hole. Steve holed a wedge out from the fairway – great shot, Steve! Gerry Newell, Sr. was 5 strokes back with a 91 (47-44). In the D Flight, Ken Wilson earned a promotion to C Flight with his second consecutive victory on tour. Ken’s round of 94 (47-47) was 7 strokes better than that of Ken Metzabaugh (101, 51-50), visiting us from the DC Metro Tour. Metzebaugh celebrated his great ‘birdie’ 2 on the Par 3 13th hole that was ‘closest to the pin’ and also won a ‘skin’. The event raised $ 90.00 for the GOLFWEEK Amateur Tour’s charity partner, Stand Up 2 Cancer. Everyone enjoyed the opportunity to play golf on such a pristine and challenging private golf course. Special mention goes to the Head Golf Professional at Radley Run, John Kellogg, and his staff, who provided our group with exemplary service and made the entire experience a most enjoyable one. Our next event is at one of the great Donald Ross courses in our area. Lulu Country Club, designed by Ross in 1912, awaits us on Saturday July 21st, 2012 . Scheduled tee times start at 12:30 PM from the 1st tee. The tournament entry fee is $110.00 and scheduled practice rounds are available.